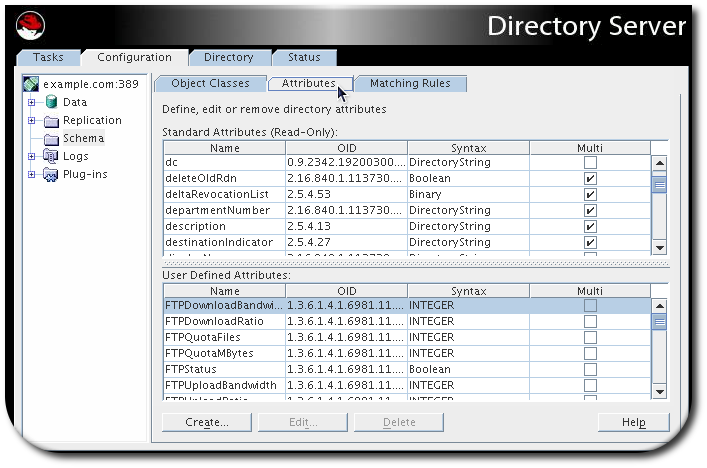 The Directory Server Console shows all attributes in the schema, and custom attributes can be created, edited, and deleted from the schema. All of the information about the attributes and object classes which are currently loaded in the server instance are visible with the other server configuration. In the left navigation tree, select the Schema folder. There are three tabs which display the schema elements loaded in Directory Server: Object Class, Attributes, and Matching Rules. The Attributes tab is broken into two sections for default and custom attributes. 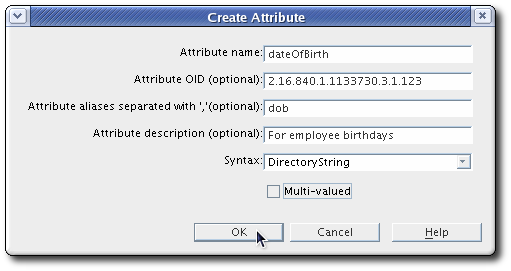 Both sections show the attribute name, OID, syntax, and whether the attribute is multi-valued. 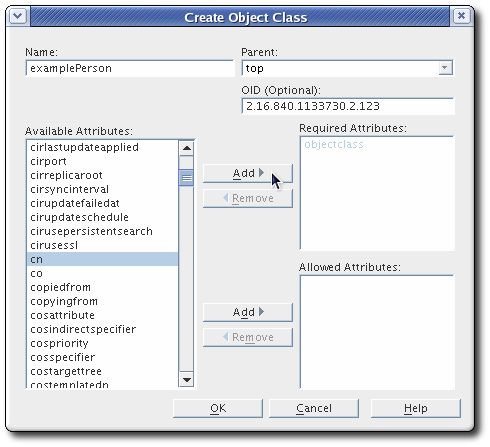 The Object Classes tab shows the list of object classes on the left. When an object class is highlighted, its OID and superior object class are listed in the fields at the top and its required and allowed attributes are listed in the boxes on the right. After adding new attributes to the schema, create a new object class to contain them, as described in Section 12.4.3, “Creating Object Classes”. 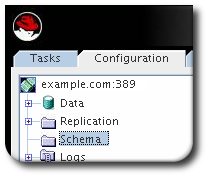 In the left navigation tree, select the Schema folder, and then select the Attributes tab in the right pane. Fill in the information for the new attribute. The attribute name; this must be unique. The OID; this is not required, but for compatibility and server performance, assigning a unique numeric OID is strongly recommended. The syntax; this is the allowed format for the attributes values. Whether the attribute is multi-valued; by default, all attributes can be used more than once in an entry, but deselecting the check box means the attribute can be used only once. 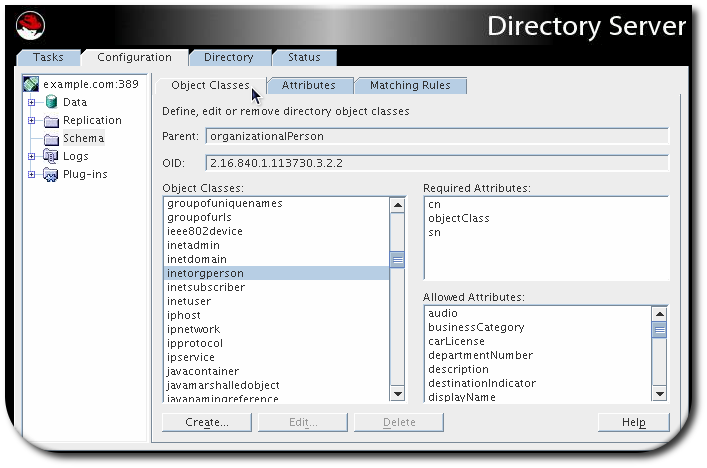 In the navigation tree, select the Schema folder, and then select the Object Classes tab in the right pane. Click the Create button in the Object Classes tab. Fill in the information about the new object class. The name; this must be unique. The superior object class for the entry. The default is top; selecting another object class means that the new object class inherits all of the required and allowed attributes from the parent, in addition to its own defined attributes. Required and allowed attributes. Select the attributes on the left and used the Add buttons by the Available Attributes and Required Attributes boxes to add the attributes as appropriate. Attributes that are inherited from the parent object classes cannot be removed, regardless of whether they are allowed or required. Click OK to save the new object class. Only user-created attributes or object classes can be edited; standard schema elements cannot be edited. Open the Object Classes or Attributes tab. Select the schema element to edit from the list. Only custom (user-defined) schema can be edited in the Directory Server Console. Click the Edit button at the bottom of the window. Edit any of the schema information. Only user-created attributes or object classes can be deleted; standard schema elements cannot be deleted. Select the schema element to delete from the list. Only custom (user-defined) schema can be deleted in the Directory Server Console. The server immediately deletes the schema element. There is no undo.